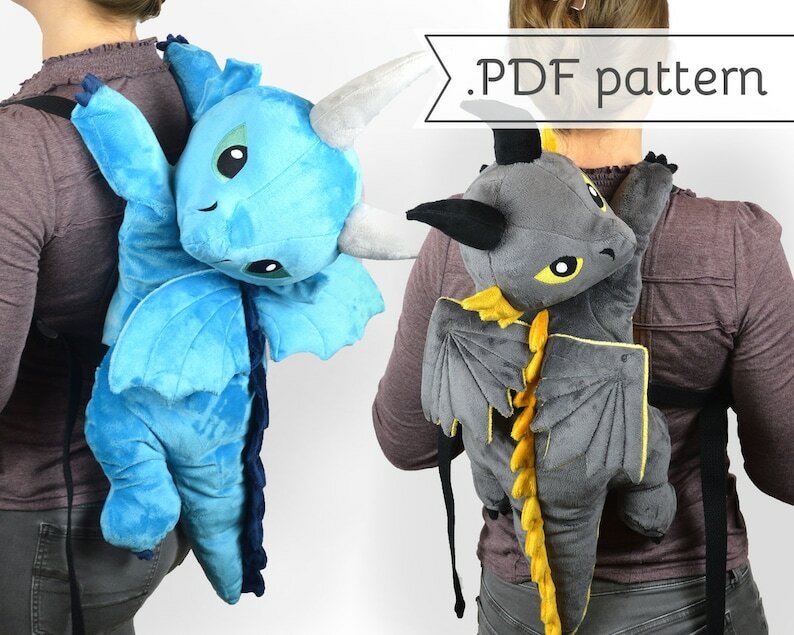 This listing is for a .pdf instant download of a sewing pattern for a backpack shaped like a cute stuffed dragon! The pattern includes 4 different wing, horn, and spike variations for a myriad of different dragons. The faces are made with machine applique -- templates for which are included in the pattern as well. The backpack is styled to look like the dragon is clinging to your back and looking off to the side. It comes in two sizes -- small and large. The small is suitable for holding a phone and a few other essentials, while the large size is an epic statement piece that can hold a standard tablet. As an optional advanced technique, you can also sew a hidden zipper pocket into the tail. large backpack: 28" long, 14" wide, and 7" tall (not including horns). hidden tail pocket: about 2" x 5"
small backpack: 21" long, 11" wide, and 6" tall (not including ears). hidden tail pocket: about 4" x 7"
small backpack: about 2/3 yd. total, with additional 1/4 yd. pieces for horns, spikes, etc. large backpack: about 1 yd. total, with additional 1/4 yd. pieces for horns, spikes, etc. › 2 .pdfs: instructions are 45 pgs. & printable pattern is 32 pgs. This pattern is available for both personal and commercial use. When selling the sewn product, please credit back to my website, www.cholyknight.com, whenever possible. Selling of the .pdf pattern is not allowed however, nor is mass-producing this product through factory means. › DO NOT: use the project and pattern for mass-production for large companies/factories/etc. I've bought many patterns from this artist. They have all been fantastic and so fun! I love it, easy to follow and understand. I cant wait to make more of these! Payment is accepted in the form of Paypal or major credit card please. Lost or damaged items may be fully or partially refunded depending on the circumstance and actions of the chosen shipper. Items are only considered lost after the estimated shipping time has passed plus a few days to account for common shipping delays that occur around holidays, natural disasters, misrouting, and the like. If the item has still not be received, the US package carrier will be contacted by me (and International package carrier contacted by the recipient, if applicable) to see about getting the package traced. Further refunds and actions beyond that will depend upon the course of action taken by the package carrier(s). Other returns, such as when a customer changes their mind, may be accepted on a case by case basis and must be brought to my attention within 14 days of purchase. At this time I do not take custom commissions for unique items, though I may open up custom commissions in the future. At the moment I'm happy to make small changes to made-to-order products.